Part of the brilliance of Ryan Coogler's Creed, which introduced audiences to Adonis “Creed” Johnson, the gifted son of boxer Apollo Creed, was that it knew how to honor the past while striking out on its own. A month before J.J. Abrams playfully remixed the iconography of Star Wars with The Force Awakens, Coogler did something even more sophisticated and nuanced with the more rough-hewn (and often racist) politics of the Rocky movies. Creed didn't simply reboot the franchise; it reframed and tweaked its whole value system while still providing all the humor, melodrama, and boxing action fans expect. In comparison, the recently released Creed II, which was directed by Steven Caple Jr. and co-written by Sylvester Stallone and Juel Taylor, is a less ambitious film. Though Coogler is only on board as an executive producer, most of the key players are back: Michael B. Jordan again plays Adonis, now a champion in his own right; Tessa Thompson plays his musician love interest Bianca Porter; Phylicia Rashad pops up again as Creed's step-mother; and, of course, Stallone's Rocky, cured of the cancer that ravaged his body in the last movie, is still wearing fedoras and offering words of wisdom. But, in the same way Creed recalled the stark underdog urgency of the original Rocky, Creed II brings to mind the flashy bloat of the Rocky sequels. Despite some lackluster stretches, there's one part of movie that hits you like a bolt of lightning: Dolph Lundgren's performance as Ivan Drago, the disgraced former USSR boxing champion who killed Creed's father Apollo in the ring before suffering defeat at Rocky's hands in Moscow at the conclusion of Rocky IV. 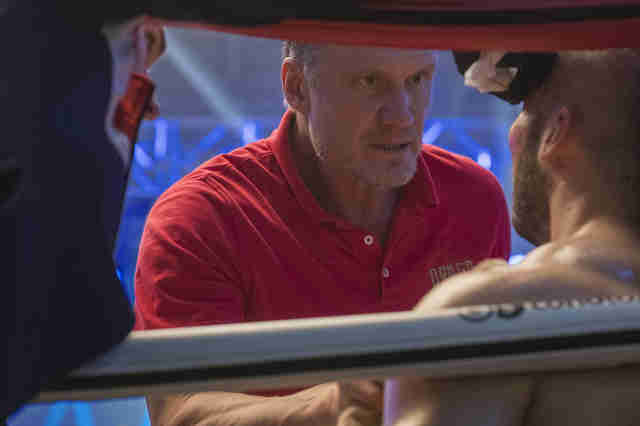 Stallone and Taylor's script, which follows a brewing publicity-driven feud between Creed and Drago's son Viktor (Florian Munteanu), gives Lundgren a handful of scenes for the 61-year-old action star to sink his teeth into. Instead of chewing the scenery, he plays it all with an emotional restraint and subtle intelligence that elevates the whole movie. The word "subtle" is not one we typically associate with Lundgren's performance in Rocky IV. When the actor was cast in the gleefully jingoistic Cold War era sequel, he was new to Hollywood and show business, having abandoned a Fulbright Scholarship to study engineering at MIT after he was hired by singer and actress Grace Jones to work as her bodyguard. (The two were also a romantic item.) Though he was born in Sweden, the super tall, very blonde, and extremely muscular actor was a natural choice for the role of Ivan Drago. "I knew I could fight, and I knew the guy was supposed to be Russian," Lungren told Grantland in a revealing interview back in 2015. "So I said, 'This is perfect for me.'" He was right: The role was so perfect for him that he spent many years struggling to escape its shadow in less financially successful films like Masters of the Universe, Red Scorpion, The Punisher, and Universal Soldier. (He revisited his role in the latter in a few totally bonkers but compelling sequels in 2009 and 2012.) In Rocky IV, Drago, and by extension the actor playing him, is presented as a merciless, cyborg-like killing machine. The movie features one of the most absurd training montages in the series, contrasting Stallone's wood-chopping workout regiment in a remote Moscow cabin with Drago's scientifically supervised conditioning in a sterile lab out of a science-fiction movie. We see Drago punching a machine that measures the "power" of his punches, translating his sweaty physical prowess into raw data. 1850! 1990! 2045! 2150! Stallone's movie, which was released smack in the middle of Ronald Reagan's presidency, never really views Drago as anything other than a cartoon villain. Yes, he has a wife (Brigitte Nielsen) and a trainer (Michael Pataki), but his most memorable lines of dialogue are mustache-twirling proclamations like "I will break you." He exists as an oppositional figure to the celebratory, James Brown-scored joy of Apollo Creed and the old fashioned, meat-pounding grit of the Italian Stallion, our hero Rocky Balboa. The ludicrous final moment of the film finds the Soviet crowd turning against Drago and rooting for Rocky, who knocks out his opponent and declares, "If I can change, and you can change, then everybody can change!" From its opening sequence, which finds Drago training with Viktor in a desolate section of Kiev, Ukraine, Creed II strikes a more serious, somber tone than Rocky IV. The version of Drago presented here, still in shape but weathered by age, is not driven by nationalistic pride and geo-political chest-pumping. (No, there aren't any references to election meddling or troll farms.) Divorced from his wife and bitter about his athletic legacy, Drago is an outcast in Russia. He clearly sees the boxing career of his son as a way to regain a sense of dignity and self-respect. As the saying often goes in sequels, this time it's personal. Lundgren plays this all with a light touch. In his one big confrontation with Stallone, which plays out in Rocky's restaurant in front of framed photos of Apollo, he toys with the sense of history between the two characters. In a profile in New York Magazine, Lundgren tells the writer how he "had to confront" Stallone over the writing of that specific scene; Lundgren thought that the lines were "going back to Rocky IV vibes." Whatever the two actors settled on, it works, creating a moment of genuine tension in a movie that occasionally falls back on soap opera twists and sportscaster voiceover to conjure emotions. As poignant and loaded as that restaurant scene between Rocky and Drago is, I found the last moment for Drago in the movie to be even more moving. As the final fight draws to a close, Donnie finally gets the upper hand on Viktor, channeling the "Eye of the Tiger" after taking the advice of his trainer Rocky. You've seen it before. Part of the larger challenge of any Rocky sequel is that the movie needs to work extra hard to make the main character an underdog again, creating a sense of inevitability to the final confrontation. They're playing the hits here. The more interesting drama is playing out in the other corner, making you wish the movie had spent more time with the Dragos than it does. When Viktor gets taken down with a series of punches and looks like he's down for the count, possibly on the brink of death, his domineering but ultimately loving father Ivan throws in the towel, calling back to the scene in Rocky IV when Rocky fails to save his friend Apollo. There's a modicum of macho poetry here: The father saves his son. In Rocky IV, the Drago name was defined by the endlessly quotable line, "If he dies, he dies." In Creed II, the character is redeemed through an act of compassion and mercy that renders him less bloodthirsty, violent, and cruel. Freed from the cryogenic confines of '80s propaganda, Drago is human after all.